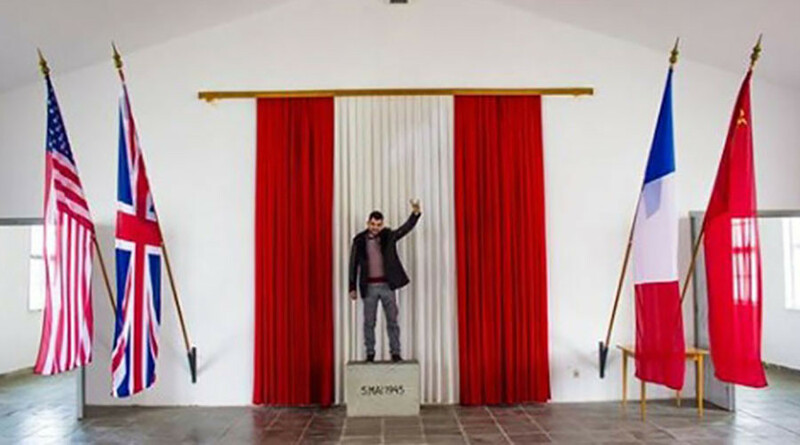 A scandalous photograph has been circulating of an Austrian member of a nationalist Turkish Muslim group standing on a monument in the Mauthausen concentration camp and making a salute associated with Turkish Islamists. The salute is used by members of the Nationalist Movement Party of Turkey (MHP). In it the little finger stands for Turkey and the index finger for Islam. Together they symbolize Turkish Islamists one day taking over the world. The man standing on top of the granite plaque at the former Nazi concentration camp was Abdurrahman Alpaslan, according to Austria’s Kurier. He is a member of Avrasya – a Linz-based division of what many say is the extreme right-wing Turkey-based organization, Grey Wolves. Local anti-fascist organizations say Avrasya openly supports Islamic State (IS, formerly ISIS/ISIL). Others maintain it’s simply an organization of immigrants who look out for each other. In Turkey, Grey Wolves are also known for frequent propaganda and inciting violence against Jews, Armenians and Kurds. The photo quickly made waves with left-wing organizations in Austria. Greens Party spokesperson Sophia Hochedlinger, who first confirmed the story to local press, said the stunt displayed shocking disrespect toward the victims of the Holocaust. She wants the local council to ban Avrasya meeting in public places. "I have to ask myself, what else needs to happen before (local mayor) Klaus Luger changes his mind?" she was cited as saying. The Mauthausen Committee (MKO) was likewise deeply distressed by the image. "Apparently, this right-wing extremist is proud of making a mockery of more than 100,000 deaths at Mauthausen,” MKÖ-Chairman Willi Mernyi said, according to Der Standard. He believes that such an “inhuman provocation” is all the evidence the council should need to ban Avrasya. However, not everyone agrees. Local socialists don’t view Avrasya as an openly racist organization, saying it is solely focused on helping migrants. The Nazi death camp was liberated on May 5, 1945 by troops from the 11th Armored Division of the 3rd US Army.